Broke a spoke on a 6ul without hitting anything - Miata Turbo Forum - Boost cars, acquire cats. The mx5 turbo worked perfectly today, chasing down much more expensive cars and generally having a blast. but had to cut the day short due to one of the spokes on my right front wheel cracked completely off.. 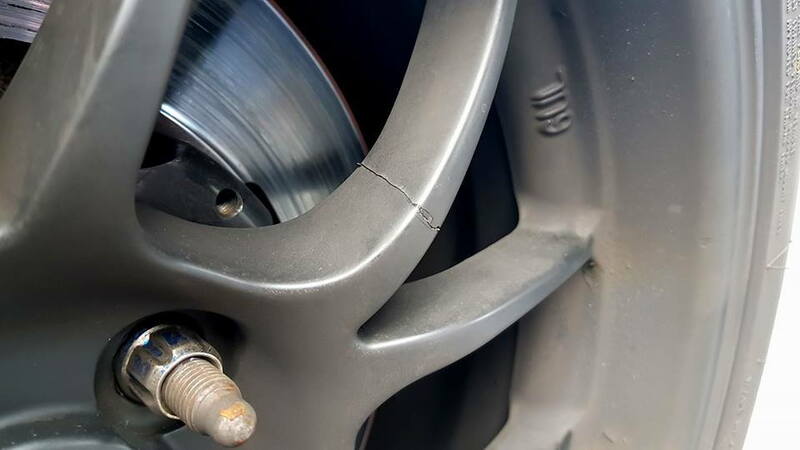 There are no marks on the rims, it it still round and in balance, and the tire is fine..
Any ideas how this could happen? common problem? will be looking to get a new set of 15x9, or 15x10..
Are the later generations stronger ? That is a 15x8 or 15x9 Gen 2 made in 2011 and early 2012, the only wheels we have reports of cracks with. Of those particular wheels produced, less than 1%. All wheels have a finite lifespan. If you have the wheel that fits the description above and it is being used for track use, it's time to replace them. Those quantities represent about .001% of total 6UL production. That is not a typo. Yeah mine are very early 15x9s they were due to be replaced this winter anyway, so im not that bothered, just happy it didnt fail worse Will have to get another set from you soon are the 15x9s in stock these days ? Our website has live inventory. If you can add item to cart, it is available. You want to view our full desktop version of the website and read the messages on the item page.